Will Microsoft beat Apple with its 'giant iPhone'? Microsoft CEO Steve Ballmer unveiled a product this week called Surface at the Wall Street Journal's D: All Things Digital conference. 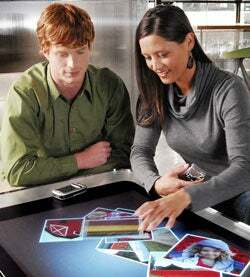 Surface is a Windows Vista "coffee table" computer that features multitouch -- the ability to respond to more than one input at a time. Surface needs no mouse or keyboard. On-screen objects move like real 3-D objects and are manipulated directly by touching the screen. If you regularly read this column, this should sound familiar -- in my February 16 piece, I discussed the coming third-generation PC user interface. In that column, I described the main characteristics of this interface: multitouch, gestures, physics, 3-D and the minimization of icons -- all elements of Surface -- and pointed out that the first such example would be the Apple iPhone. Such a user interface lets you "grab," "slide," "pinch," "rotate," "expand" and "move" on-screen virtual objects as if they were real. I pointed out that the shift from the first generation to the second -- from command line to graphical user interface -- was 23 years ago, and that we were long overdue for the next generation. I also asked whether the desktop version of this third-generation UI would come from Apple or Microsoft. The answer, I suggested, was both. When I wrote that, I assumed Apple would be first to announce a third-generation computer. This week, Microsoft beat Apple with an announcement. But will Apple beat Microsoft with shipping an actual product? Microsoft plans to sell Surface devices starting later this year to hotels, stores, restaurants and public entertainment venues as a kind of gimmicky marketing, gaming and informational kiosk. Surface performs some neat tricks. Five cameras watch from below for what happens on the system's screen. Software processes the live video and recognizes objects and hand movements in real time. Unlike, say, Tablet PCs, Surface doesn't have an actual touch screen. All input is based on what the cameras see. While iPhone's multitouch is optimized for two touches, such as expanding a photo by moving two fingers away from each other, Surface has been optimized for up to 52 touches. That means five people can use all their fingers and Surface will register all the movements. Multitouch Texas Hold 'Em anyone? Surface can recognize objects you place on the screen if those objects have a three-quarter-inch square bar code-like identification tags called dominos affixed to them. Any object placed on the screen will immediately be surrounded by an on-screen glow.